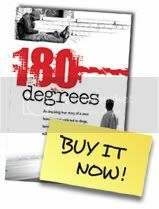 If you’ve read the book "180 Degrees", there is no way you don’t remember Uncle Louis or my Aunt Dawn. Even after going through so many of their own trials (literally) and tests in life, today they both stand as a testament to how you really can change your life if you set your mind to it. In this compelling video, Louie shares his personal insights; he says that "I am an inspiration to him." Coming from a man that epitomizes positive change himself – I can’t tell you how much of an honor it is to hear him say those words and what it is to also have the admiration from my Aunt. I am very proud of them both. As I continue to share my past life through a visual journey and at the same time include thoughts and insight in the present day, I had to make a trip to the infamous Miami, Florida (for many reasons, not the least of which is the story in 180 Degrees). Beginning with my Aunt Dawn’s smiling face as she shows us the club where we spend many nights just hanging out and waiting for the other side of midnight. Right off of South Beach, the place reminds me of so many memories – memories that I talk about in the book – of how life was so different back then. You could say that this was the beginning of the end (only for there to be another new beginning much later), after I moved here as a teenager. Living with my Aunt Dawn, Uncle Louis and their kids, the house we were in was right on the waterway where there was a boat, a playhouse and lots of good times. When I hug Aunt Dawn today, I am overcome with emotion as she declares her infinite pride in my accomplishments since then. Being strong supporters of my recovery, both Uncle Louis and Aunt Dawn being proud of me is an amazing feeling and a true blessing. It wasn’t all pretty though. There was a time when Aunt Dawn cut up all my clothes and threw them in the bay. In the video, you get to see the bridge where I spent time as if it was “home” and you also get to see the street where my friend Jimmy and his dad were waiting to kill me. You also see where we lived and where I spend nights homeless under Hallover bridge. It seemed the drama never ended. This was also the same place where I got a call from Uncle Donald telling me that there were six police cars waiting in his driveway looking for me. In many interviews and of course in my book, I often mention the documentary “Cocaine Cowboys” and if you have seen Miami in those days, you’d attest to the fact that this documentary says it all. It really was that crazy. Schools were infiltrated with people from shady backgrounds. In fact, my school was very corrupt. I remember hundreds of pounds of pot around us every day. As I taped this video, it was like another lifetime ago. Although I had a very chaotic time living in Miami, while visiting now; sober, I only remember the fond times with my Uncle Louie, Aunt Dawn, my family and all my childhood memories. Sadly, I also remember my Uncle Donald, whom past away 2 years ago (cause of death unknown). I loved him very much. I wish he was here to see the success of the book and to share the many laughs I had with him.